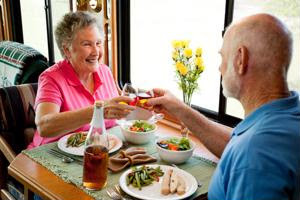 Dining tips for clients of senior care services who have diabetes. While having a home-cooked meal every night is delicious, sometimes dining out is a nice treat. Salt: WebMD says that people with diabetes should only consume 1,500 milligrams of sodium each day, so tell your clients to choose a dish that is low in sodium or have them ask for their meal to be prepared without it. If they're unsure of the salt content, encourage them to ask. Special requests: Let your clients know that if they're unsure of the serving size they can always ask their server. As for sauces and dressings, they should ask for these to be put on the side so they are not adding additional calories or fats that they shouldn't be eating. You should also remind your clients that eateries such as buffets may not be a good idea since they often can't accommodate special food preparation requests. Ordering: When deciding on an appetizer, encourage your clients to choose fresh fruits and vegetables. They should refrain from eating pickles, canned vegetables and cheeses. Advise they to avoid mixed dishes and gravies and to choose foods such as broiled, grilled or roasted fish, poultry or meat.